The Myanmar brutal regime has viciously persecuted the Rohingya Muslims. The Myanmar regime does not even recognize Rohingya Muslims as legal citizens of Myanmar. They cannot travel without a permit. At the time of marriage they must give written assurance that they will not have more than two children. They are subjected to force labor, as they have to work one day at any military or national project and one night as a sanitary worker. Their agriculture lands are confiscated and distributed amongst Buddhists. For the last few years, a campaign has been launched against the Rohingya Muslims, under the supervision of Buddhist mushrikeen, in which thousands of Muslims have been killed after brutal torture. What rubs salt in the wounds of the Rohingya Muslims is the cowardly attitude of the current rulers. When Rohingya Muslims sought refuge in Bangladesh, Indonesia and Malaysia, the Muslim rulers pushed them back. Recently, since April, again Rohingya Muslims have tried to migrate to Indonesia and Malaysia, but the rulers refused to grant them refuge and abandoned them to the sea or human traffickers, who take them to the jungles for forced labor or kill them and bury them in collective graves. Hizb ut-Tahrir asks the Raheel-Nawaz regime what kind of mutual cooperation will take place? By keeping silent over the Myanmar regime’s atrocities, does it not strengthen the oppressor? 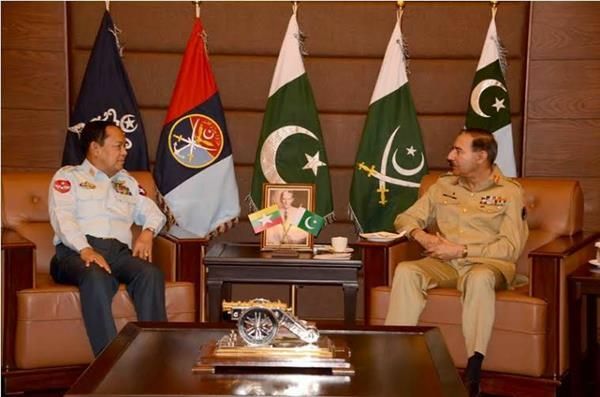 Is there not a single man of conscience in the Raheel-Nawaz regime to reject all contact with the Myanmar regime? Or will the Raheel-Nawaz regime again claim that we are too weak to face the enemy, as they pretend with America and India? Can Pakistan, with the world’s seventh largest army, equipped with nuclear capability and missile technology, not stop the weak Myanmar regime? “If they seek your help in Deen, it is your duty to help them” (Al-Anfal:72). "اگر یہ دین کے بارے میں تم سے مدد چاہیں تو تم پر ان کی مدد لازم ہے"